My eldest son, seven year old E, has always been insatiably curious about the world around him. And, unfortunately, my GCSE in biology hasn't really equipped me to answer his numerous questions about the natural environment. I'm usually saved by Google, but my access to the internet isn't always great when he's asking me to identify common trees, flowers, birds or insects. We are lucky enough to live in an area with a wide variety of natural environments: we live close to the beach, the river, the town and the countryside and not far from Dartmoor. So we're trying to learn more about what we see, hear and smell as we explore the world. I say we - because I'm embarrassed about my igorance and I want to learn this stuff too! Here are a few ways I'm helping to unleash his inner naturalist. Who knows, maybe I'm nurturing the next David Attenborough? 1. I've bought him several spotter type books so he can tick off things he's found and take notes about when and where he came across it. 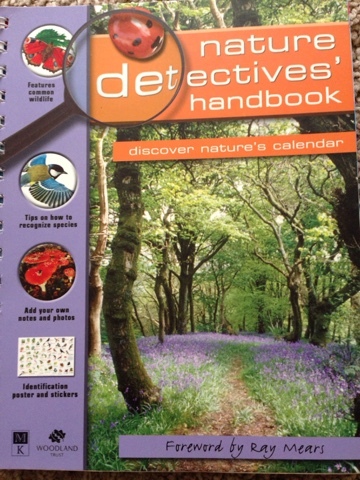 His current favourite is the Nature Detectives' Handbook. 2. Our local nature reserve wardens at Dawlish Warren often run Junior Rangers events for children aged between 7 and 11 years old. Earlier in the summer he attended a free session on Dragonflies and Damselflies. As well as exploring the reserve, the children also made a model of what they'd seen. Art and craft are not favourite subjects of E, but he thoroughly enjoyed putting his damselfly together and I was really impressed with the result. The Junior Rangers get their own badge and newsletter too! 3. We try and take part in activities and campaigns run by charities and organisations that promote the natural environment, such as the RSPB, which runs an annual census of birds in your garden, or the Woodland Trust, or the WildlifeWatch section of the Wildlife Trusts. 4. Forest and outdoor school. E's school often runs a 'Forest School' after school club and he loves taking part. Locally, we also have a couple of Forest Schools that run holiday and weekend activities. We've yet to try them, but they are definitely on the radar. 5. When we're out and about we often stop and look or listen for signs of wildlife. I ask questions like: what do you think this is? what do you think made this? what do you think makes that sound? why do you think that? Even if we don't know the answers, maybe we can look them up or maybe I'm just helping him to further develop his curiosity about the world we live in. How do you help your child learn more about nature?